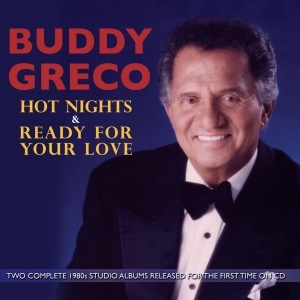 This collection comprises two albums recorded by Buddy Greco in Los Angeles in 1982 and 1984 respectively, working in both cases with producer/arranger Alf Clausen, who went on to become the sole composer of music for The Simpsons. The two albums very much reflect their times, with a substantial proportion of contemporary soul and AOR material and arrangements. As a result, the collection makes for a cohesive creative entity, presenting a somewhat different side of Buddy’s extraordinary versatility as he steps away from the more familiar jazz, big band and easy listening genres into a more contemporary area, performing a blend of well-known standards alongside original songs, including a couple of his own. The two albums were originally only ever released on LP and cassette in the USA, so this thoroughly enjoyable CD will be a welcome addition to Buddy’s fans collections.